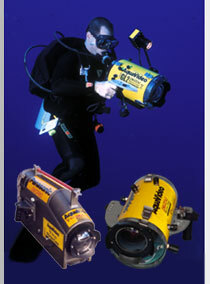 AquaVideo's main products are underwater cases for video cameras and underwater lights. Aquavideo began manufacturing underwater video housings in 1981, and was the first company to manufacture and market self-contained underwater video systems. AquaVideo has been there for virtually every development in the video world. We have manufactured custom-fitted housings for more than 400 different video systems of all sizes and shapes - from consumer camcorders to Broadcast Betacams and High Definition cameras. We have also made many specialized systems: For NASA (Seven cameras used to track astronaut training in the underwater NEUTRAL BOUYANCY LABORATORY; and a self-contained system for evaluating the Shuttle solid rockets in the water before retrieval); Remote controlled, pan and tilt cameras for the U.S. Olympic Training Center; and even some waterproof electronic transport cases for the US Navy Seal Delivery Vehicles. Yet, our everyday business is manufacturing housings for consumer and prosumer camcorders that are used by divers around the world. AquaVideo has developed methods that allow us to make a professional quality housing for virtually any camcorder, with very short turnaround times. Most manufacturers only offer housings for a very few camcorders or a few housings that can fit multiple cameras. The AquaVideo method is not a one housing or "one size fits all" approach because to make one housing fit multiple cameras means that it probably won't work well for any of them. The housing diameter, length, mounting plate, front plate with dome, controls, etc. are fitted specifically for each camera - yet because of our experience and extensive parts inventory, we can make an excellent housing for even a newly released camcorder in just a few days. Obviously we have stock housings for the more popular camcorders - but the point is there is no substantial difference between a "stock" housing or one of our "custom fitted" housings for one of the less popular camcorders that are not supported by other manufacturers. The information below gives a complete description of the features of normal AquaVideo housings. AquaVideo's other main product is underwater video lights. Although not inexpensive - the SuperNova 250 and 350 that we have manufactured - with minor upgrades - since the early '80s are still probably the finest battery operated underwater video lights available for the serious amateur or professional underwater videographer. We also manufacture HMI/HID lights and some lower wattage, less expensive lights as well. See our UNDERWATER LIGHTING GUIDE for more information. Easy slide in/slide out camera installation and removal - takes just a few seconds. The system is extremely simple to operate. There is a control to turn the power on and off, and for basic operation the user simply starts and stops the tape with the trigger control. The iris is automatically controlled by the camera, and focus is automatic (it can also be preset - since it is setup for extreme wide angle shooting, with a depth-of-focus range of about 3" to infinity in average conditions, and in bright, clear water conditions there is true zero to infinity depth-of-focus - so close that even subjects that are touching the front port of the housing are in focus.) Either way there is no need to worry about focusing during normal shooting. Although extremely easy to use for the novice, the housing/lens system has been designed with full macro/zoom capabilities to allow the advanced user to fully explore the creative possibilities of true macro underwater video, as well as use the zoom for certain special situations. As you read on you will see that our housings for 3-chip "prosumer" housings have some added capabiities - but they are in the form of "overrides" that are only used if you want them - if you choose not to use them, the system is just as easy to use as the housings for the fully automatic "consumer" type camcorders. AquaVideo underwater video housings are designed to be reliable, durable, and easy to use. Our standard construction material for the body of the housing is a rugged, special high grade PVC plastic. The front and backplates are 1" clear acrylic. A high heat welding process (similar to metal welding) used on the handle wings and internal parts, combined with the heavy wall PVC main body, result in a tough, durable housing - capable of withstanding almost any kind of abuse. Working depth ratings of 300 feet for most models make the standard AquaVideo housings suitable for any sport diving, as well as most commercial, scientific, and professional diving applications. PVC housings are completely corrosion proof and eliminate the condensation and electrolytic corrosion problems associated with aluminum housings. AquaVideo can also manufacture ALUMINUM HOUSINGS - primarily for the much larger broadcast cameras. Aluminum is rarely necessary for the smaller housings and in fact there are drawbacks to using aluminum unless it is really necessary. However for very large housings, special applications, or for those who simply prefer aluminum construction, all AquaVideo housings are can be made in aluminum versions on a special order basis. Whenever possible AquaVideo housings are made with a CYLINDRICAL SHAPE because it is the most pressure resistant, and it is very stable. STABILITY is extremely important in an underwater motion picture camera because any instabilities show up as unwanted (and annoying) movement on the screen. The front and backplates are made of one inch thick CLEAR, HIGH GRADE ACRYLIC. Clear coverplates allow easy visibility of the control functions and the LCD screen (yes, the normal housing for current camcorders allows the LCD screen to be opened with excellent visibility through the back of the housing which is clear.) Further, any potential problem is minimized because all of the inside of the housing is visible. If a leak would ever develop it would be seen immediately. The HANDLES CAN BE REMOVED EASILY to allow the housing to fit into a compact case for transport. The handles are usually mounted pointed downward, but can be mounted upward if preferred. The handles attach to the HANDLE WINGS that are welded to the main body of the housing. The PVC plastic "wings" are typically two and a half inches wide, and run about two-thirds of the length of the body. These wings increase stability by "damping" side to side rolling motion as well as forward and backward pitching motions. The handle wings also provide an excellent mounting surface for any type of underwater light. Trigger: Used to start and stop the tape. Macro/Zoom: Primarily used to shoot true macro. (i.e. magnified images of small objects.) Can be used to perform a normal zoom underwater, although there are limitations. These are the standard controls for the most common single-chip consumer-type camcorders - but it gets a little more complicated for the more professional cameras so this is probably a good time to get into the three main classes of camcorders. 1) "Consumer" type single-chip camcorders. These camcorders use one "chip" to sense all of the colors and create the picture. The chip is a compuer chip similar to a memory or processor chip except that it consists of 400,000 or more tiny "pixels" or picture elements that sense the light. Over these pixels is an array of thousands of tiny color filters and through an ingenious method of scanning the three primary colors can be discerned and a color picture is created and then recorded on the tape (or disc). A camcorder that has more than about 400,000 pixels exceeds the resolution ability of both the recorder and our current television to handleand for video purposes the extra pixels are "wasted", however the extra resolution is good if your camcorder also has a memory card that can store a higher resolution still image. The filter/scanning method of creating color video works very well, however it is not quite as good as the 3-chip method used by "prosumer" and profession/broadcast camcorders. The current mini-DV and Digital8 formats are about as good as it needs to be/will ever get without going to High Definition (Note: the new DVD disc recorders actually record in a format that is not quite as good as MiniDV and Digital8). Although all of the current versions of these cameras generally make extremely good pictures, and can have a vast array of effects, titling features, etc. they often don't have some of the overrides (in particular "settable" white balance) of some of the "prosumer" camcorders so the standard controls on housings for these cameras are Power, trigger, and zoom as mentioned above, since these are about all you would normally use underwater. It is possible to get additional controls for autofocus on/off and manual focus, photo shot, and others for an additional $75 per control. AquaVideo housings have been designed using the most reliable sealing technology available. A complete explanation of our x-ring double seals, locking clamps, and many more of these all-important reliability features is contained in a later section. The single most important factor that will affect the quality of your underwater video pictures is the quality of the optical system. AquaVideo is known for providing the best optics available. In addition, since we offer a fully corrected underwater optical system, it is extremely easy to use - yet provides advanced capabilities for the experienced user. Wide Angle Lens Converter: Wide angle lenses dramatically improve the underwater clarity and colors of underwater pictures, and they also eliminate the need for focusing - and they are really essential for underwater video. The standard lens on most camcorders is not wide enough for good underwater photography - however the solution is very simple - you use a wide converter lens on the camera which increases the angle by 50 to 100%. (This converter simply screws into the filter threads on the front of your camcorder and is actually a fairly common accessory for normal abovewater shooting as well.) All AquaVideo systems are designed to be used with one of these accessory wide angle converter lenses. The wide converter is supplied and included in the price of the housings for single chip camcorders - because housing length and dome have to be designed with the size of the wide converter in mind and since the converters for the single chip camcorders are relatively low cost it is a lot easier to supply it than to try to figure out or anticipate which ones the customer might have. Dome Port Optics: The term port refers to the area of the housing that the camera "sees" through. Although flat ports are cheaper to manufacture and easier to design, they cause several problems. First, due to refraction, the light rays are distorted. Rays from the edges of the picture travel farther so they are focused at a different point than those from the center. Both of these factors cause a significant loss of sharpness, particularly in low light - and the negative effect is even worse with wide angle lenses. 2) Like a diver's flat mask, a flat port magnifies the image by 25% which means the photographer must move back to get the same image size, causing a loss of clarity and color - due to shooting through more water. The solution to both of these problems is the dome port. The light rays travel straight through the port material and enter at the same distance from the center point of the lens. The rays are not distorted and they focus at the same point. The magnification effect is also eliminated, so a wider angle is achieved. One of the reasons dome ports are harder to design is that they cause a shift of the whole focus range to between 0 - 9 inches in front of the dome. In the past it was necessary to compensate for this - however the autofocus on virtually all of the camcorders made in the last 5 years or so handle this very well and no compensation is necessary. With some camcorders there is a limit to how far you can zoom before this close focus won't work but you can generally get at least 25% of the zoom range and this is much more than you normally would (or should - since you are generally much better off in underwater photography to move closer, rather than zoom in.) However, if greater zoom range is really necessary it can be achieved by adding a close up filter which costs between $10-50 depending on the size of your lens. In short, normal wide angle shooting, reasonable zoom ranges, and true magnified Macro, can all be easily accomplished on the same dive without any . Although the standard controls are usually all that are required, controls can be fitted to operate almost any feature on the camcorder. Cost of a typical optional control is $65.00. AquaVideo's optional Surface Monitor/Record kit gives you the capability to use the camcorder's video output to monitor the video picture on the surface, or to record it on a separate recorder. This option provides the ability to use these low cost housing/camcorder combinations for commercial diving and inspection. It can also be used for broadcast and professional production by sending the output to a higher quality recorder, or live feed. By using the latest video camcorders and the surface monitor kit, results can be obtained that are as good or better than many high priced commercial diving systems. Color Monitor (Option): Some customers have asked if we can incorporate one of the small color LCD TVs into the housing for use as a viewfinder. AquaVideo has offered this option for years, ever since these small TVs became available. All this requires is that the housing be about 1 and three quarters of an inch longer than normal. However, users should be aware that because of the way LCD monitors work, they are often difficult to see underwater. Built-In LIGHT Capability: (Option) Certain housings have sufficient space inside for a battery pack for an underwater lighting system (The battery is connected by a cable to the lamphead outside the housing). When possible, this is an excellent use of the space and makes a very convenient underwater housing/lighting system. The standard version of a housing for a particular camcorder will be made as small as possible since housing size is the overriding priority for most customers, even if it requires using an external battery for the lighting system. Most of the camcorders that fit into a six inch diameter housing take up virtually all of the space and do not have room for the lighting system. On the other hand most camcorders that are too large for the six inch diameter housings and require an eight inch diameter housing do have room for the battery pack for the light. Some underwater videographers, that consistently use underwater video lights, prefer the convenience and simplicity of having the built-in light battery packs over the smaller size of the standard housings. Accordingly, AquaVideo will custom build a housing for any camcorder in the larger version that will take the internal battery pack. The additional cost for the larger housing is $125 over the cost of the standard housing. As an example: the standard six inch diameter housing for the Sony TR600 Hi8 camcorder does not have room for an internal lighting system battery. For an additional $125 the housing can be made as an 8" diameter - with space for the battery. The extra charge does NOT include the battery pack, or the rest of the lighting system, it is simply to cover the extra cost of the increased size and custom manufacturing. Customizing and Custom Features: AquaVideo's extensive experience with custom housings, remote controls, and specialized systems for broadcast, industrial and military applications, means that if you have seen it or can think of it we can probably make it. However, as the selling price of individual housings decreases and housings have become more standardized there has to be some limit on the availability of custom services. Although we can charge extra for the custom features if we actually make the sale, there simply is not enough time in the day for our personnel to discuss and/or explain the hundreds of possibilities, and really no way to charge for this consulting time. In business terms customizing tends to be a losing proposition, so most underwater video companies either do not offer or have stopped offering custom services. AquaVideo believes that offering these custom services does provide a valuable service to the diving community. We do not want to discourage customers from requesting custom features to meet real needs. We would like to continue to offer custom services and we can continue if buyers will respect our personnel's time by carefully considering whether the feature you are requesting is really practical. Please realize that the standard housing designs have been carefully thought through, and are the most practical for the vast majority of users, and with the options offered above we can cover the needs of most users with special applications. Beyond that if you have an unusual application we will be glad to consider ways to handle your situation. For more of the information on housing construction, sealing techniques, etc. read the U/W Housing Technology section below. The fundamental purpose of an underwater housing is to protect your valuable, sensitive, and vulnerable video system. AquaVideo housings use the most reliable sealing techniques available. Proper seal design techniques are well known among designers in the oil, marine, and aerospace industries, however they are frequently ignored in the underwater camera housing industry - either through ignorance or in order to save labor and tooling costs. The first rule of good seal design is that the seal should be in a FULLY CAPTURED GROOVE. This means that when the coverplate and the housing body are mated together the seal is totally surrounded on all sides within its groove. A common sealing technique used on other housings (e.g. Hypertech, Ikelite, Quest, VideoSea, Gates, etc.) that violates this rule is the use of a lip seal on their front and/or backplates. The main reason a manufacturer would use a lip seal is because because it is easy to manufacture with common tools. The O-ring is simply stretched over the lip. The problem with a lip seal is that the ring is surrounded on only three sides - one side is left open. The seal can extrude outward, and also the seal is not protected from foreign matter working its way into the seal area. The second rule of good seal design is that the seal area should be extremely SMOOTH, FLAT, AND SQUARE, if not, a great deal of pressure is required to force the seal into rough areas or areas that are not perfectly flat or square with the other sealing surfaces. This is a common situation with the router cut backplates mentioned above. Although a seal can still be made by using powerful spring clamps, the reliability factor goes down because it is easier for foreign matter to disrupt the seal. AquaVideo also manufactures some housings that do not use a cylindrical shape, e.g. our rectangular housings for Broadcast VCRs. On this type of housing we still use a captured groove, however the groove is made using extremely precise, computerized milling machines. One key to the reliability of any system is redundancy. This leads to what is probably the most well known feature of AquaVideo housings: the X-ring seal. In contrast to the circular cross section of O-rings, these seals feature a four lobed, X-shaped cross section. A double seal is not simply twice as reliable as an o-ring. A simple mathematical analysis would suggest that reliability for the x-ring would be the square of whatever reliability factor you pick for an O-ring. For example, if on average users have a failure due to a piece of sand or dirt on the o-ring seal once in every 75 uses (surprisingly, this is not an unrealistic figure), then, by using a double seal x-ring, the same user could expect a failure only one out of the seventy five times the first seal failed - or one in 5625 times. Obviously this analysis isn't perfect - there could be a particle large enough to break both seals at the same time - but something that large would be difficult not to notice. A further advantage of our X-ring is that it is very long lasting. Two factors combine to extend the life of the X-rings (and consequently its long term reliability): 1) because it is a premium seal, the manufacturer uses premium grade rubber and 2) O-rings tend to flatten out causing them to lose sealing efficiency. Eventually they take a "set" or permanent distortion and need to be replaced. Due to their design, X-rings require very little pressure to create a seal so they do not take a "set" as O-rings do. Consequently X-rings tend to last for years and usually require replacement only if they are physically damaged. Although they are more expensive initially, X-rings tend to be less expensive in the long run. Another redundancy feature is on our clamps. Most housings use quick release spring clamps to hold the coverplates on and to provide the initial pressure on the sealing ring. The clamps on the AquaVideo housings are very similar to those you have seen on other housings except that they feature a spring loaded security lock which prevents the possibility of the clamps popping open accidentally. The final factor in designing a safe, reliable housing is that it should be easy to verify that the seal has actually been made. The CLEAR FRONT AND BACK PLATES on AquaVideo housings make the seals completely visible - it is very easy to see that the seal is properly seated, in fact you can see the actual double seal line on the inside of the coverplates. If any sand, grit, hair, etc. is in the seal area - it is easily seen. Finally, the clear plates provide excellent visibility into the housing and any water leak would be immediately visible. Many housings on the market (including the Amphibico, AquaVision, and Sony, as well as the Ikelite housings with aluminum front) do not allow you to see the O-ring when the housing is sealed. In essence you are forced to make an in-water test of the seal - with your camera inside - every time you make a dive! The most common question about sealing is "How do you seal the controls?" This problem was solved about forty years ago when Ikelite developed a very reliable shaft seal (often called a control gland) which is now used by several manufacturers - including AquaVideo, Gates, Ikelite, etc.. The control gland is designed with an inner seal that seals against the shaft which almost never has a problem. The outer seal is the one that seals the gland up against the housing wall and sometimes will cause problems, depending on how it is mounted. The control seal "gland" has a threaded body that goes through a hole in the housing wall. A nut on the inside of the housing tightens the gland and keeps the O-ring on the gland pressed up against the outside of the housing. The problem is that the nut on the gland can work itself loose over time. If so, the O-ring seal will not make firm contact with the housing and will leak. All AquaVideo housings are made so that the hole is threaded. The gland can be threaded into the hole and the O-ring will stay in firm contact with the housing wall even if the nut on the inside were not there. The combination of the threaded hole and the nut on the inside means that it is virtually impossible for the gland to loosen up unintentionally. A common misconception about underwater housings is that the depth rating depends on the seal. Although a housing with a lip seal might have a problem with the ring extruding at great depths, on housings that use a captured seal the seal should remain watertight even at extremely high pressures (i.e. thousands of feet in depth). The limiting factor for depth is usually the ability of the housing materials to withstand the pressure without crushing. Ironically, the first ten feet are the most difficult to seal because there is not enough pressure to force an O-ring or X-ring into place. The smoothness, flatness, and squareness of the sealing surfaces are critical in those first few feet, which is why AquaVideo prefers to use a lathe turned sealing surface, and an X-ring - which minimizes the pressure needed to make the seal. There are no authoritative industry or government studies that anyone can refer to that analyze the risk factors of various housings or sealing methods. However, there are large dive operations in the Caribbean that rent these systems and have experience with all makes of housings - that have been on hundreds, and even thousands, of dives. Operations like Photo Bonaire, and Fisheye Photographic in Grand Cayman; Abernathys's Underwater Adventures, etc. - say that the simplicity of the AquaVideo system, and method of sealing has proven to be much more reliable than the others. Our record isn't quite perfect, but we think you will find it is the best in the industry - even though with the wide variety of systems we manufacture we have had many more opportunities to fail. It has been pointed out to us that one company that uses O-rings offers a camera replacement guarantee against flooding, so they must think O-rings are good enough. We are not saying that O-rings are bad - we use them ourselves on non-moving parts that do not get sealed and unsealed constantly - because under ideal conditions O-rings seal fine. However, if you check out that guarantee you will find that it is limited. If the housing floods, it will be tested by making sure that the O-rings are clean and without any damage. If it seals under those conditions (which it probably will) you are not going to get your camera replaced. Underwater camera systems are not used in ideal conditions. Seals do get nicked, sand tends to be everywhere that you might be diving, and often batteries or tapes need to be changed on a rocking boat, usually in a hurry before the next dive. We cannot guarantee that you can be careless and get away with it, but anyone can see by looking at the cross section of an x-ring that the double seal is going to be much more forgiving on those occasions where your preparation is less than perfect. Ultimately, our design philosophy is to be respectful of Murphy's Law: If anything can go wrong, it will go wrong - and at the worst possible moment.